May all your Docs questions be answered! Docs is a family business that has been around since the 70's. The main boss these days is Kimberly. If your nice to her you'll get thru the door! Also, being 18 is a must! 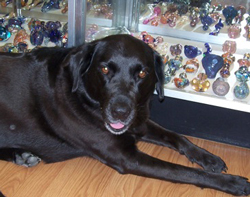 We are known for the best selection from hand pipes, bubblers, water pipes and vaporizers. Docs likes to support the American artist so you won't find the same stuff you find everywhere else (aka the cheap imported crap). We have different glass blowing companies all over the US that we support. If you're looking for that special collector piece we have it. We have pieces from Chaz, Shad, Bearclaw, and many others. Docs very own canine superstar! Cashing in at 9 years old, Kimberly Kensington has worked at Docs for her entire life. Although she certainly knows how to relax, don't let this slumbering pup fool you! She has travelled to the most distant reaches of the Earth, playing a special role in seeking the very finest products Docs has to offer. Whether sniffing fire hydrants in Jamaica or burying bones in Buenos Aires, Kimberly has never forgotten her Baltimore roots. Come and pay us a visit -- maybe you'll hear tales of her most recent adventure! Kimberly Passed away at 13 yrs old. Brewer has recently just joined her . ( Jan 16) He was about 11. Hopefully they are running together and waiting for me to join them one day! Kimberly and Brewer have both now crossed the Rainbow Bridge. We will deeply miss them both. Docs has always had a doggie as our main mascott, best employee, best greeter , crotch sniffer n sales person and all around just a joy to be at work with! We still have Lorelei , our 1 eyed wonder who was rescued from the Carolinas By Save a Lab.. We look forward to who her new sidekick will be. Update.... Her new sidekick is Zinnia!! Another dogue de bordeaux like Brewer! Zinnia is a Pets In Distress rescue. For more Dogue de bordeauxs please visit them to adopt! !